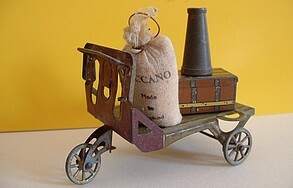 You will find photographs of models toy-trains in particular French, HO gauge (OO) and 0. These are classified by manufacturers and, if I can (I do not have all the necessary knowledge), references manufacturers and other details. The error is human, I apologize in advance to those that you can find and that you will tell me. If models are not visible on this page, is that I have not had the opportunity to make photographs. Databank digital participatory old miniature trains. Many catalogues already online. Come and participate in this project. In return you'll see hundreds of documents and catalogues. Click on the image to the left for more information. 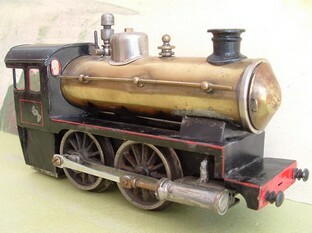 I am Joel, a French amateur / collector of miniature trains and especially old train-toys. My preference is therefore rather towards models in tin, zamac and in other alloys and built between the years 1900 and 1960. It gives me the opportunity first of all to make them "work", and to play ! And it is well their first vocation, not? 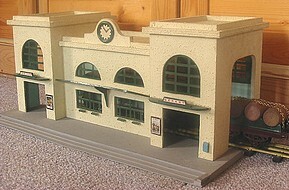 Thus, I am interested currently to trains toys US, and more particularly the Lionel trains in standard (54mm spacing between rails), those manufactured between 1905 and 1942. It is very coloured, they are large and heavy and, for me, that remains in "the toy spirit". It's a great pity for me that these trains was not imported into France, because today, it is necessary to turn to the US to find this type of material and that has a price... If you live on another continent and you collect the French toys, you know what I want to say ! The page "dossiers" (See at the foot of the page) details a model which "was peeled", dismounted. The files will follow one another at non definite intervals... To finish a new page of random images is available. Trains well on, but also of the photographs "blow of heart" and others to discover (frequent renewal). You can well on to make me share of your remarks or only for the pleasure ! All the photographs were carried out by the authors of the site, except contrary mentions.